This glorious lentil sambusa recipe is infused with niter kibbeh, a spiced clarified butter that is widely used in Ethiopian cooking. You can use spring roll wrappers if you don't fancy making the pastry, but it's worth giving a go if you have the time – it's a very simple dough to make and has a beautiful texture. Follow our berbere recipe to make this amazing spice mix for the filling. 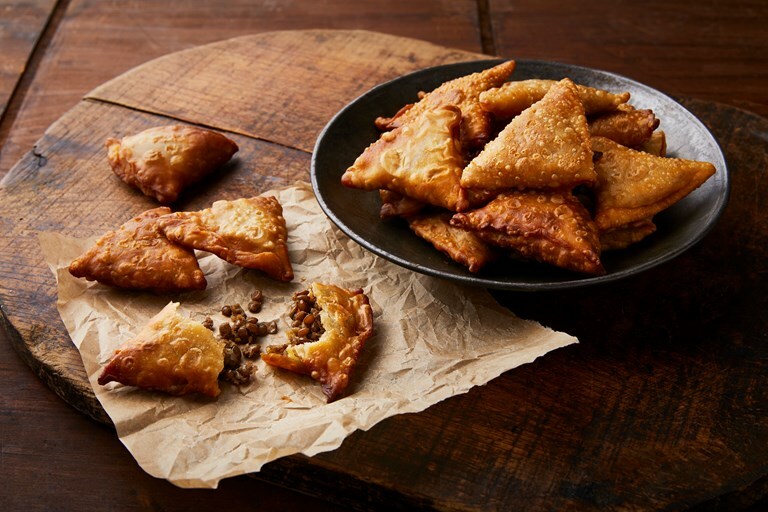 Inspired by the Indian samosa, the East African sambusa is flavoured with the fiery berbere spice blend and uses the wonderfully fragrant niter kibbeh; a clarified butter infused with ginger, garlic, cinnamon, cardamon and bay leaves to name a few. Save the leftovers in the fridge and use it in place of oil or butter! Switch out the lentils for lamb or beef mince for a variation.